Identifying the type of wood used in the construction of a piece of furniture or a structure that you didn't build can be critical if you want to make modifications to either. In order to properly stain or otherwise refinish a piece of wood, it helps to know what kind of wood it is, and if you intend to drill or nail into the wood, it's critical to know what type of wood it is so you can choose hardware that won't damage it. When working with wood, you should know whether it is a hardwood or softwood as well as the exact species of tree that the boards were cut from. Find a piece of the wood item or structure that is unfinished. If you can't find any unfinished section, consider scraping or chipping off a small piece in an inconspicuous place to reveal the unfinished wood. Stains can affect the appearance of wood, and clear-coat varnishes can make it difficult to determine the actual hardness of the wood. Press your fingernail into the unfinished wood. If you can make an appreciable dent in the wood, then you know it is a softwood. 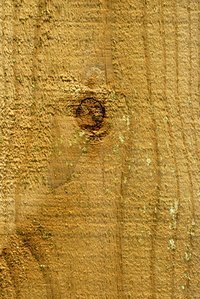 The most common softwoods used in construction and furniture are pine, aspen and cedar. Figuring out whether a wood is softwood or hardwood is usually the most important step for practical considerations of construction and finishing. Compare the grain of the wood to a set of reference chips or pictures. Many furnishing stores carry sets of "chips" which show off the grain of many common types of wood. If the grain of the area that you're comparing these references to is unclear, then you might need to smooth the area out by further chiseling and sanding so that the grain is more clearly revealed. What Types of Trees Are Hardwoods?